What is a gas pressure regulator? These devices are commonly found in homes and commercial properties. We use regulators routinely to maintain our daily lives. For instance, in your home, you may be familiar with pressure regulators on your gas barbecue grill to regulate propane, inside your home to aid in heating your furnace and regulate natural gases. When driving your car, there’s a regulator to maintain your fuel. Pressure regulators are also widely used in medical and dental equipment to regulate oxygen and anesthesia gases. 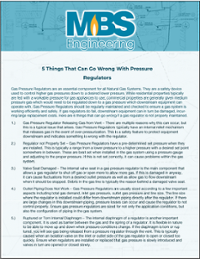 There are a lot of uses for pressure regulators, and in each example it provides the same function. Pressure regulators reduce a supply of pressure to a lower outlet pressure and work to maintain this outlet pressure despite fluctuations in the inlet pressure. The reduction of the inlet pressure to a lower outlet pressure is the key characteristic of pressure regulators. As it pertains to natural gas, a pressure regulator is a valve that automatically cuts off the flow of gas when it reaches a certain pressure. The prime function of the regulator is to put exactly as much gas into the piping system as the load device takes out to prevent damage to the equipment and tools. Without these devices, pressure could become too great for the equipment to operate properly and the pipes could rupture. Regulators must conversely match the flow of gas through the regulator to the demand for gas placed upon the system, in conjunction with maintaining the system pressure, keeping it within acceptable amounts. When determining what type of pressure regulator is needed, there are several qualifying questions to consider: what is the fluid used, what is the temperature, what are the operating pressures and flow requirements? 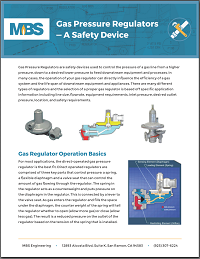 For additional resources and information on pressure regulators and natural gas, contact the professionals of MBS Engineering. MBS Engineering has the experience, knowledge and skills to become your go-to company for all natural gas-related needs, including gas leak detection, service and repairs, seismic gas shutoff valve installations, microturbine energy solutions and more. 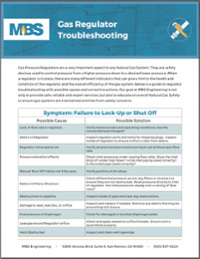 If you have questions about your natural gas systems, contact MBS today.